Are we all in agreement here girls? First up, is fashion. Festivals have a distinctive style, it’s all about mixing prints with casual pieces that are comfortable and effortless but well thought out. I’m talking florals, I’m talking aztec, I’m taking denim and I’m talking fringing. For your capsule festival wardrobe that is ready to conqueror rain or shine, I’d recommend either wearing a pretty floral or aztec short dress or playsuit or try a top with fringe detailing, crop top, swing cami or vest in either a plain colour or a aztec or floral print with either some shorts or a skirt. The key is to keep this part of the outfit short on the legs, that way, if it is super warm you’ll be kept cool and if it rains, you wont risk your clothes trailing in the mud and puddles. As a cover up or a contingency plan in case it rains, I’d recommend taking a mac or parka with you as they can be folded up quite small and will fit in a little bag to be carried with you while you’re watching the bands. 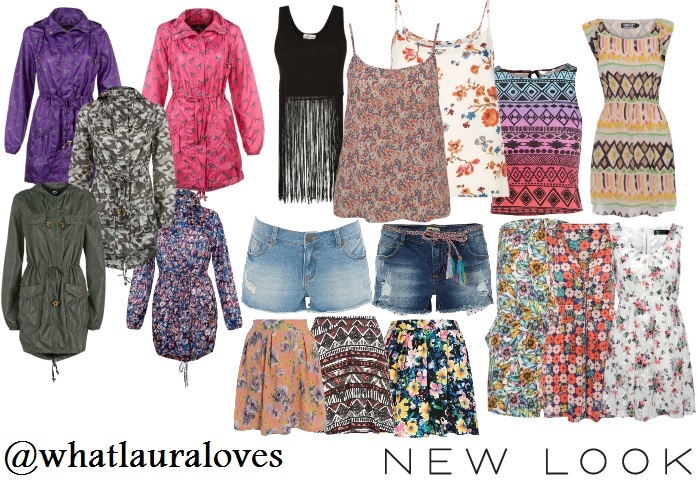 These are my top picks from the New Look website. I love their clothes as I find that many of their styles transpire from the standard sized line to their Inspire range. I got my inspiration from their new interactive infographic that shows a timeline of festival styles from 1969 with hippy fashion through to today. It shows how music and fashion are inter influential through the decades and crossing all different festival genres. For footwear, I’d opt for a pair of wellies, that way you’re ready to face the unpredictable British weather head on. Whether you’re a Hunter‘s girl or you’d prefer some gorgeous lilac ones like mine from the quintessentially British brand, Joules, wellies are a sure fire way to keep your feet comfortable while you’re standing all day and if it rains, you’ll have a great time plodging all while your feet are dry and toasty. To keep the glare of the sun away from your eyes, opt for some sunglasses that are light weight and compact, mine are the Ray Ban 3025 Matte Gold Aviators from Sunglasses Shop. I love these glasses as they keep the sun out of my eyes, they look stylish and they don’t take up much room in my bag. I’d recommend taking a cross body bag with you as they’re easy to carry and leave your arms free to dance and hold your drink. It’s really important to get a bag that either zips across or has a turn lock on it for added security, after all, you don’t want anyone being able to dip into your bag while you’re enjoying the music. Mine is from River Island but I’ve seen some other gorgeous ones from Primark and ASOS. With staying in a tent in an unsecure environment, I’d recommend leaving all of your valuable possessions at home- if you can’t afford to lose it then don’t take it that’s my motto. I wouldn’t take anything that was sentimental away with me to a festival or camping as I couldn’t afford to lose them or have them stolen- they’re priceless and I’d never be able to get them back. The same goes for electricals- I would take a cheaper, pocket sized camera away to capture my memories rather than risk damaging my Nikon 1. If I were going to a festival for a few days or away camping, I’d curl my hair with my conical wand on the morning that I left. I wouldn’t be washing my hair while I was away so with a bit of hairspray the curls would stay in and drop to waves over the course of the weekend. I’d pop on a floral hairband like these from Primark or a floral crown to give your hair a girly pop of colour and a nod to the hippy fashion of 1969. For toiletries, I’d opt for small, travel sized staple products that do the job but that you don’t mind getting a little messed up or lost in the tent. You need some things that are practical and lightweight for carrying from the car to your pitch. To freshen up my hair and revive the volume in it, I would recommend only one product and that’s Batiste dry shampoo. They do a range of minis in Superdrug that are perfect for travelling. They will keep your hair free from grease and full of texture. When it comes to brushing your locks, the Denman D7 Hairbrush Compact is the perfect addition to your festival swag bag. With a vanity mirror on one side and a pop out hair brush, this is the perfect hair tamer for when you’re on the go. Brush your locks with one side, check out your style with the other. To keep you looking put together and polished, I’d recommend painting your nails in a shade that compliments your festival outfit before you go and take a nail file with you in case you break a nail while you’re away. I always seem to crack a nail while I’m travelling or at work and I never have a nail file with me so I’ve really started to consciously carry one around with me. The nail colour that I’ve gone for here is Coral Reef from Models Own, also available at Boots. It is generally accepted that you’re going to need to lose a little bit of your hygiene routine when you’re at a festival. Gone are the clean toilets, showers and luxurious nightly routine. This is one of the only times I’d recommend turning to wipes, particularly for make up removal. The Tea Tree Cleansing Wipes from Derma V10 at Home Bargains are a good option as they contain natural tea tree oil, aloe vera and peppermint oils that are designed to remove make up, clean the skin and prevent spots. These come in a pack of 25 so there’s more than enough to use for a weekend away, which is a good thing as they aren’t very damp wipes so I find that I need to use more than one, even on a light make up application that you would expect to wear at a festival. For eye make up removal, I would highly recommend the Halo Eye Make-up Remover Pads. These are absolutely brilliant. They aren’t oily like other eye make up remover pads that I’ve used before and they don’t leave a greasy film on my eyes after I’ve used them. They remove all of my eye make up without tugging at my eyes as they’re so gentle so I think these would be a great addition to your festival beauty bag. Pick up your own pack in time for the festival you’re going to from Superdrug or Tesco and while you’re at it, check out their deodorant wipes too. The Halo Deodorant Wipes are a quick and effective way to freshen up while you’re at a festival. The wipes are really soft and moist which is so important when you’re somewhere that you can’t get a shower as they give you a refreshed, clean feeling. They are great to use over the whole body and they don’t sting at all so they’re great for sensitive areas like your underarms. Not only do they act as a deodorant but they clean your skin too so if you’ve got a little muddy while dancing to your favourite singer then you can wipe yourself over with one of these. The final and perhaps the most essential product needed to survive a festival environment is a pack of Feminine Freshness Wipes from Femfresh. I don’t know about you but I honestly can’t think of anything worse than using a portaloo. Even the clean ones make me squirm. These wipes can be used to keep you feeling fresh and clean down there while you’re away at a festival but also as toilet roll if your water closet of choice is lacking them. These are available from Boots along with the rest of the Femfresh line. 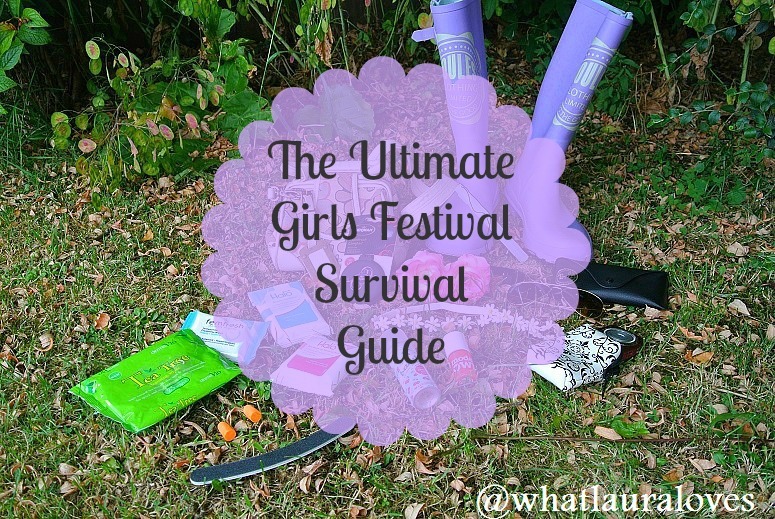 I think that covers all of the bases then girls- fashion, weather, hygiene and personal space, so you should be able to survive anything that a festival throws at you now. Do share your own personal festival stories, tips and tricks below. I’d love to read them! Previous Post Want to GET NOTICED?